This bulb requires the ballast of your light fixture to be elimated. These T8 LED bulbs use just 14 watts of power and will no longer require ballast. 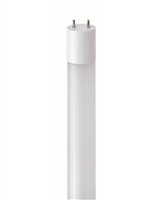 In addition to the 5 year warranty, these bulbs offer a crisp white colored light that will not lose lumen output as experienced with fluorescent. These are one of our most popular lamps for use in auto body and mechanic shops due to the daylight color.